Believe it or not, I bought this pendant for $6.99. The website is Silver Jewelry Club (link below). The jewelry is FREE, you only pay shipping. They offer certain items at certain times, but when you order it, everything is $6.99. They do have a whole catalogue where you can actually purchase some of their other things. The things I saw for “Free” were really nice, and they are just as nice once you receive them. 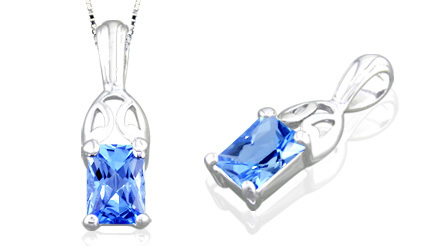 You also have the opportunity to buy necklaces to go with the pendants when you order the free jewelry. I was impressed with the jewelry because it is unique looking, and they have many different colored gems to choose from. The only thing I didn’t like was how long I had to wait to receive it in the mail. (About 7-10 days). It could of been because of the holiday that it took so long, but it was worth the wait once I received it. Any of this jewelry would make a great gift, and the receiver would never know that you only paid $6.99. If you want to check out their jewelry, click on the link below, or the link in my helpful links section at the right. This entry was posted in Mom, Saving Money and tagged Free jewelry, gift ideas, Review: Website, silver jewelry club. Bookmark the permalink. Just read all your blogs. They are very interesting, and helpful. Good Job!!! !